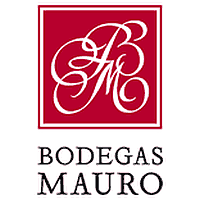 Bodegas Mauro / Garmon – Luxury-focused. Estate-driven. World-renowned. Mauro is located in the Duero river valley at Tudela, a few miles to the east of the city of Valladolid. Due to geographical location and local politics, Mauro does not qualify for the Ribera del Duero DO. No matter, the wine has established a world wide reputation for quality in a contemporary style… rather like the “Super Tuscan” reds from Italy. Mauro was created in 1978 by Mariano García, the former winemaker at Vega Sicilia. Mariano remains very present at the winery, although vineyard management and winemaking are now in the capable hands of his son Eduardo, and the company run by his other son, Alberto. Many of the vines are 60 or more years old now, and the extraordinary Terreus vineyard was planted so long ago even the locals do not know the exact age. The small berries give wines of serious structure that require extended ageing first in cask, and then further ageing in bottle. The resulting wines share a dark rich colour, great freshness and purity on the nose, and a fine balance between the oak and rich black fruit. On the palate they have a smooth style, silky texture and a fresh, vibrant energy that makes them light on their feet despite their weight. The Mauro team has also purchased vineyards in nearby Toro, where they make an exciting wine called San Roman. Garmón Continental completes the García Family trilogy of wines and wineries in the Duero Valley – Mauro (Tudela de Duero) and San Román (Toro) – with an exciting and exclusive family run project based on the vineyards, with Tempranillo or Tino Fino as the main protagonist, where production will not exceed 80,000 bottles per year. The first vintage, Garmón 2014, comes from a selection of vines, aged between 40 and 80 years old, grown on small plots in four villages located in the eastern areas of the Ribera del Duero: Baños, Tubilla and La Aguilera on the right bank of the river, Moradillo on the left side. The altitude, between 850 and 1,000 meters, in addition to the freshness and slow maturation from these soils, predominantly clay-calcareous and gravel, confer tension, depth and a controlled maturity.